Dive deeper into the world of corporate compliance and gain the knowledge and skills needed to guide companies forward in this increasingly complex field. With this Dual Degree, you’ll gain a sophisticated understanding of the latest regulations and compliance strategies, and use your wider understanding of the business world to inform your thinking. In addition, you’ll acquire the leadership and problem-solving skills needed to successfully advise any corporation around the world. 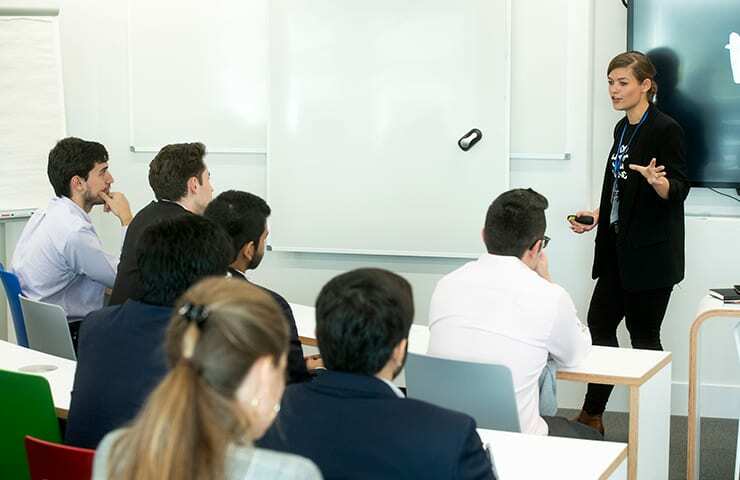 The International MBA curriculum will provide students with a comprehensive grounding in the fundamentals of business, covering a broad range of subject areas from corporate finance and managerial economics, to marketing and strategy. Taught with IE’s signature hands-on methodology, students will put their skills to the test while gaining the corporate insight necessary to thrive in the business world. The program is highly customizable, empowering students to design their own academic journey with optional labs and immersion experiences, enhancing their unique profile in a competitive market. After completing the IMBA portion of the Dual Degree, students will move on to the Master in Global Corporate Compliance. Now more than ever it is vital that lawyers can ensure companies respect legal norms, as well as stay true to their own values and ethics. That’s why this curriculum first provides a complete understanding of the global macro-juridical corporate framework and its most important governing bodies. The program proceeds to show how companies are building their cultures around core values, informing their corporate social responsibility strategy and policies. In addition, students will have the opportunity to dive deep into various corporate risks and opportunities, gaining a sophisticated understanding of how to best design a strategy that empowers companies even in uncertain business environments. In just 19 months, students will graduate from this Dual Degree with a profound understanding of legal frameworks and compliance, and how to navigate its challenges and opportunities. What’s more, they’ll be immersed in IE’s diverse, international community of like-minded professionals eager to make their mark on the legal world, as well as some of law’s leading professionals and researchers. Upon graduation, students will be ready to catapult their careers to the top as leaders in compliance across industries. The total tuition for this Dual Degree is 94.800 euros*. IE uses a rolling admissions process; therefore, there is no single application deadline. However, we recommend applying early given the limited number of places in the program. • All expenses related to academic learning, including: Access to relevant technology, multimedia learning tools, conferences, access to physical and digital library resources and access to the various IE Centers of Excellence. • A contribution to IE Foundation, a not-for-profit organization which supports students during and after the program. Please bear in mind that the tuition fee does not include the admissions fee that amounts to 125€. This amount is not refundable and cannot be deduced from the cost of the program. Admission to the program is valid for two successive intakes. *Tuition fees are reviewed annually and are subject to change. Ranging from a diverse number of nationalities and backgrounds, our faculty is made up of practitioners, entrepreneurs, executives, academic experts and even authors published in top journals who are completely accessible to students, guiding them in the path to accomplish their goals. The Master in Global Corporate Compliance (LL.M./MsL) is a comprehensive program tailored to meet the needs of today’s changing business environment. Academic Director of the Master in Global Corporate Compliance (LL.M./MsL).